Do you want to know two simple ways of coping with pain in labour? Read on my pregnant friend because this post is full of useful information! I’m basing this on my observations and experience as an L&D nurse on how I see women get through the pain and intensity of labour. Your experience might be very different! I cannot really talk about all the variations of what could happen during your labour and delivery. But I really hope that this information will assist women and their partners in preparing for birth. You won’t be able to fully plan for your birth. It’s truly a time when you have to be willing to let go of your expectations. I won’t be able to tell you what contractions feel like, it’s so individualized! I can tell you that every woman is different in regards to what they like to do while feeling contractions. Some women like to walk around or be massaged. Some like to be touched, while others want to be left alone. I spontaneously started singing during labour with my first! It helped me focus and got me through the pain. These are the types of things you won’t know beforehand, and you’ll have to figure it out once labour starts. That said, it might be helpful to do a bit of research and practice. Two things are certain from what I’ve seen. If you want to cope with the pain, you have to focus during the contractions and rest well in between. Those are the universal things all women do who are able to give birth naturally! If you do have a very specific birth plan, find a way to be flexible and know that you might have to deviate from the plan. For example, you might not, under any circumstance, want an epidural for pain. That’s totally acceptable and feasible, but once you’re in labour you might feel differently and really want one. Don’t beat yourself up for wanting to change that when the time comes. If your plan is to labour without pain medication, it is very important to rest between contractions. As hard as they are, if you’re able to relax in between, you’ll have a far easier time of keeping calm and being able to cope with the pain of the next contraction. 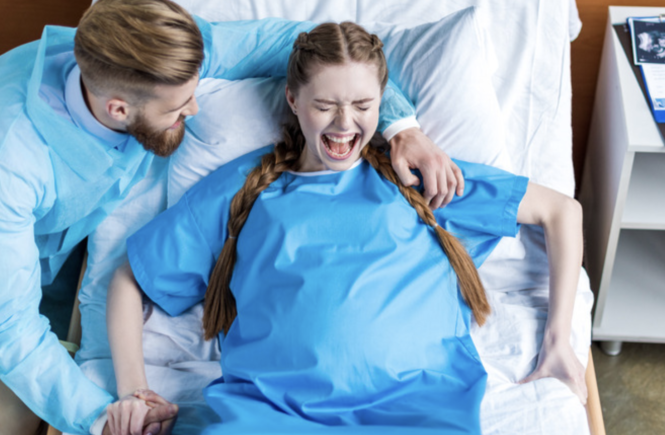 Of all the vaginal deliveries without epidurals I’ve witnessed, almost all the women were able to rest and sometimes sleep between their contractions. A good way to achieve this is to have as few people as possible with you at the hospital. That way you won’t be distracted between contractions and won’t feel like you have to entertain a crowd. Have people with you that you love and trust and only those that will help you rest and not expect conversation all the time. Practice this skill before you go into labour. Start a regular meditation practice that will enable you to go into a restful state quickly. The other aspect that’s going to get you through the pain of labour is your focus. How do you usually get through a hard task? If you are able to focus intently during the pain, it will help to get through each contraction. A birth mantra which can be a sentence or word that you say over and over again during a contraction. An example of this is: “Each contraction brings me closer to meeting my baby”. There are lots of birth mantras out there. Do a google search or come up with a sentence of your own that holds meaning for you. Your partner can be a great thing to focus on. You can stare into their eyes or look at something on their clothing. Anything really that works for you. Your labour nurse might be the thing you focus on! I wouldn’t be able to tell you how many times I’ve been used as a “prop”. A picture of something or someone you love very dearly. Maybe a picture of another one of your children. An object that you love and has value to you, for example, something from your childhood. Essential oils can help you focus. Bring smells that are familiar to you! Lavender is one that really relaxes and aids with focus. Find something in the labour room to focus on, like a sign or window or really anything. It’s really about finding your rhythm and starting a ritual between each contraction! Once you get into that rhythm, every contraction becomes easier. If your ritual is no longer working, find something new that does. Try anything and everything! Your body and intuition will probably guide you into something that works! You might need to change positions or try another mantra. Print out a list of mantras before you go to the hospital. You really don’t know which one you like beforehand. Labour is like a very intense workout every two minutes or so. The bottom line is you have to find a way to focus on each contraction and rest well in between. Women that are able to master this can even sleep between contractions. I’ve seen it so many times! I find a lot of women are hard on themselves when it comes to labour and giving birth. There is no way to be in complete control, especially not during a complicated process like birth. During the birthing process, it is essential to try to let go of control. I understand that it’s not an easy mindset to change. Maybe try to practice during your pregnancy. Don’t forget to relax and enjoy the journey. Parenthood is even more erratic than pregnancy and birth, so this is a great time for you to learn to surrender your power. One of my favourite things to do is read birth stories and I’d love to hear yours! Don’t hesitate to contact me with your story, and I would be happy to post them for others to enjoy and learn from. Reading other women’s experiences is a great way to help prepare for your own birth.